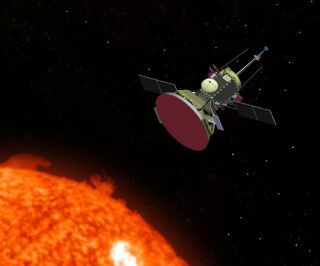 Artist's concept of NASA's Solar Probe spacecraft making its daring pass toward the sun, where it will study the forces that create solar wind. WASHINGTON- Spurred to action by Congress, NASAis finally moving out on an ambitious mission to send a spacecraft closer tothe sun than any has ever gone before. NASA directed the Johns HopkinsUniversity Applied Physics Laboratory (JHUAPL) to begin preliminary work on aproposed $750 million Solar Probe mission last month, with plans to launcharound 2015 to fly through the sun?s corona and study the stream of chargedparticles it regularly blasts into space. At its closest?approach, the Solar Probe would flywithin 4.3 million miles (7 million km) while being bombarded by radiation and blastedby withering temperatures. The Laurel,Md.-based lab will receive $13.8 million from NASA this year to begin pre-PhaseA development work to address the mission?s considerable technical risks, amongthem designing a carbon composite heat shield capable of protecting the roughly992-pound (450-kg) spacecraft fromtemperatures that will reach as high as 2,552 degrees Fahrenheit (1,400degrees Celsius). And with NASA intending to solicitinstrument proposals for the Solar Probe mission this year, APL will use partof the $13.8 million to support the instrument accommodation assessments thatmust happen before NASA can select a spacecraft?s science payload. NASA is funding APL?s pre-Phase Awork and the upcoming competition to pick the Solar Probe?s science payloadwith the help of $17 million Congress added to the space agency?s 2008 budgetfor the mission. Sen.Barbara Mikulski (D-Md. ), chair of the Senate Appropriations commerce, justice,science subcommittee told Space News in a written statement she was pleasedNASA tapped APL to begin work on Solar Probe. ?I foughtalongside the scientific community to start Solar Probe because of itsimportance in understanding the effects of the sun on the Earth,? Mikulski saidin a May 9 statement. ?These effects are profound on everything from the healthand safetyof our astronauts, to civilian and national security satellites, our powergrid system and even international airline flights over the Earth?s poles. Iwill continue to fight to ensure that there is funding in the federal checkbookfor this important priority.? Mikulski?spledged support could prove essential to ensuring that the Solar Probe workgetting under way this year continues into 2009. Although NASA intends to fundSolar Probe instrument proposals starting next year, the agency has requestedno 2009 money for other aspects of the mission?s development. As aresult, after spending nearly $14 million this year on Solar Probe,expenditures would drop to zero in 2009 unless Congress again decides to addmoney. NASA?s five-year budget projection, however, does include $3.4 millionfor Solar Probe in 2010, $40.1 million in 2011, $74.2 million in 2012 and$106.3 million in 2013. To keep Solar Probe on track for a 2015 launch, NASAwould need to come up with an additional $500 million. The SolarProbe mission concept has been incubating for more than 30 years, only to berepeatedly stymied by budget and technical limitations, according to WalterFaulconer, APL?s business area executive for civilian space programs. ?In thelast incarnation, it was a $1.2 billion mission that required an RTG,? he said,referring to radioisotope thermoelectric generators that transform the heatfrom decaying plutonium into electricity. ?And that was a big improvement overa previous version which was a multi-billion-dollar mission.? In 2007,NASA?s associate administrator for science at the time, Alan Stern, gave APL astudy contract worth $1 million to produce a Solar Probe mission concept thatcould be accomplished for around $750 million, including launch, but notrequire a nuclear power source. With NASAuncertain about how much plutonium-238 it will be able to obtain in the future,the agency is trying to preserve the current inventory for a flagship-classmission to the outer planets it intends to launch in the 2015-2020 timeframe.Previous Solar Probe concepts entailed sending a fairly massive spacecraft outto Jupiter for a gravity assist, an indirect route that added several years oftravel time and required a nuclear-power source to compensate for the dearth ofsolar energy available so far from the sun. Faulconersaid it was not easy getting the scientists and engineers to abandon some oftheir preconceived notions and take a fresh look at what needed to be done tosend a probe soclose to the sun. ?We had to knock some heads since alot of people felt like they had studied this to death,? he said. By the timethe study was completed in March, the APL-led team, according to Faulconer, hadcome up with ?a very elegant mission that answered the mail - it?s $750million, it?s non-nuclear and we did not give up any of the science.? The APLteam did, however, relax two long-established objectives for the mission. Ascurrently envisioned, Solar Probe would not go as close to the sun and it wouldnot fly over the sun?s poles. Previousmission concepts called for flying within 1.8 million miles (3 million km) atclosest approach, closer than the current 4.3 million miles. But even at 9solar radii, a distance of roughly 4.3 million miles, the probe still will bewell within the sun?s outer atmosphere. ?It?s stillhot but not as hot,? Faulconer said. SendingSolar Probe over the sun?s pole also turned out to be ?a real cost driver? forthe mission, according to Faulconer. Dropping that requirement ?really openedthings up.? ?There wasa scientific reason why they wanted to go over the pole,? he said. ?But itturns out that the phenomenon scientists once thought occurred only at thepoles we now know thanks to recent discoveries fromour Stereo mission that the same phenomenon can be observed over other partsof the sun.? Instead offlying out to Jupiter, Solar Probe would use seven Venus flybys over nearlyseven years to gradually shrink its orbit, Faulconer said. APL?s MercurySurface, Space Environment, Geochemistry and Ranging mission is employing a similarapproach, flying past Venus in 2006 and again in 2007 as it seeks to settleinto orbit around the innermost planet in 2011. The optimaltime to begin the Solar Probe?s seven-year journey would be 2015, Faulconersaid, with less optimal launch opportunities in 2013 and 2018.